Hanoi (VNA) – A ceremony was held by the Ministry of Finance and the State Securities Commission in Hanoi on August 10 to launch the derivatives market, which is expected to limit risks and diversify investment products, thereby increasing the securities market’s attractiveness. 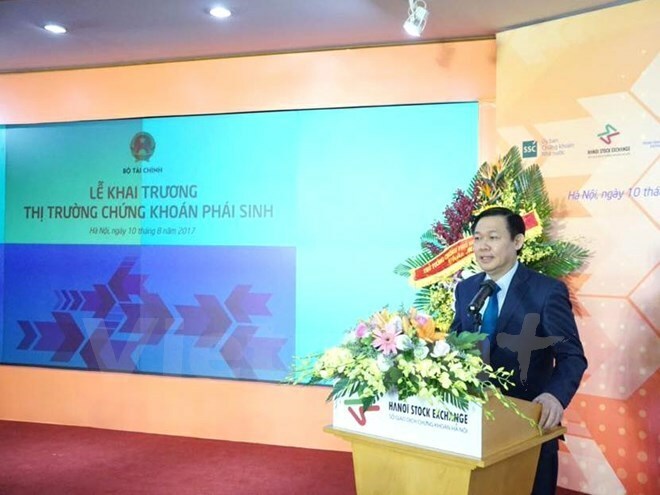 Addressing the event, Deputy Prime Minister Vuong Dinh Hue asked the operators of the derivatives market to run the market in a smooth, stable, transparent and safe manner. He asked the Finance Ministry to continue working closely with other ministries, agencies concerned and localities to refine relevant mechanisms in line with international practices. The derivatives market will help increase the liquidity and scale of the stock market and support it to grow stably and be a safe, long-term capital mobilization channel to service the country’s economic growth, he said. According to Hue, the stock and bond markets currently account for 57 percent and 24 percent of the gross domestic product (GDP), respectively. The capital raised via the securities market make up roughly 23 percent of the total social investment. Chairman of the State Securities Commission (SSC) Tran Van Dung said the SSC will continue directing the Hanoi Stock Exchange and the Vietnam Securities Depository to study more products to put them up on the market, adding that the VN30-Index futures contract will be the first product in derivatives market. In the near future, HNX30-Index and government bond future contracts are also planned for. The most important factor for the derivatives market is margin lending. In the derivatives market, an investor must make the deposit in cash or shares at the Vietnam Securities Depository and at market trade members (securities companies) before a transaction takes place. The current collateral requirements in the derivatives market are 80 percent in cash and 20 percent in shares, but at the initial stage to ensure the highest safety, the margin ratio is set at 100 percent in cash. The derivatives market will open at 8.45am, 15 minutes earlier than the opening hour of the stock market and close at 3pm. Prices of products are allowed to fluctuate by /- 7 perent and price quotation is 0.1 VN30 index point. Transaction unit is one contract. Contract unit is valued at 100,000 VND per VN30 index point. The last trading day is the third Thursday in the month of maturity. The month of maturity is the current month, the next month and the last two months of the next two quarters.